Drama students at The Sixth Form College, Solihull showcased the work of German playwright and director Bertolt Brecht to an audience of friends and Family this week, while undergoing assessment for their A level studies. First year Drama and Theatre students performed extracts from “The Exception and the Rule” and “The Good Person of Szechwan” by Brecht. They were assessed on chosen roles: acting, directing, set, costume, lighting or sound. They worked in teams to put their performances together and were encouraged to explore the style of Brecht in their interpretations. 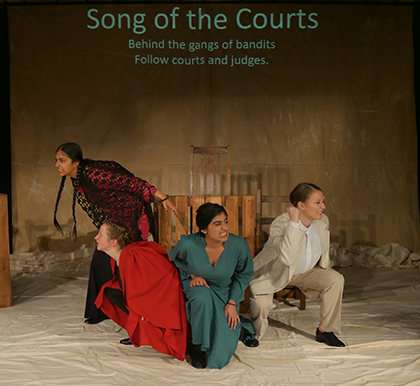 Their performance of “The Exception and the Rule” explored the justice of the courts in Mongolia in the early 1900s and examines issues as relevant today as they were then. It told the tale of a merchant, accused of killing his coolie in the desert and the trial that followed. Meanwhile, “The Good Person of Szechwan” saw students tell a parable set in pre-war China, in which the gods look to justify their existence by producing a truly good person. The play follows the progress of this good person, a penniless prostitute and the way her goodness is taken advantage of, plus how she combats this by disguising herself as a man. 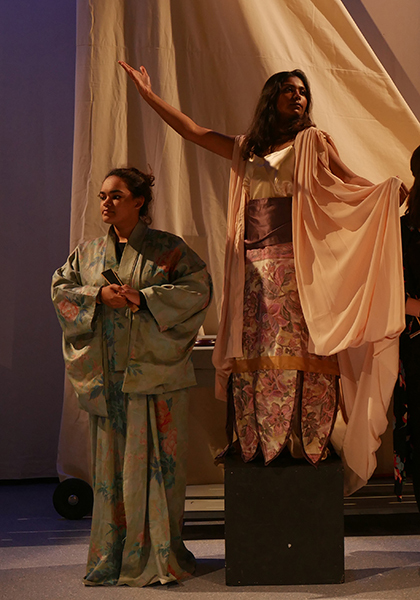 A level Drama and Theatre is just of the courses the College offers in the Creative Arts field; other A level subjects include Music, Fine Art, Graphics and Photography, as well as a BTEC in Art & Design.